The Mom: Informed: If your under 1 year old is "too big" to rearface, you have bigger issues to worry about. If your under 1 year old is "too big" to rearface, you have bigger issues to worry about. Ever since the new AAP carseat recommendations came out there has been a LOT of chatter amongst moms. There has been a ton of support for the recommendations and conversely there has been an obscene amount of opposition to it. While I believe in ERF(extended rear facing) and will choose this route for my children, ultimately it is still just a recommendation and parents are free to choose what they want....and herein lies the reason for my post. Now, this infant seat can accommodate an infant up to 40 lbs. 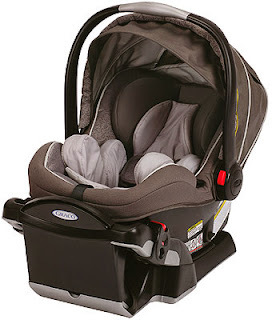 This convertible seat can accommodate an infant up to 40lbs. So, basically, that means if your child outgrows the infant seat...you can still rear face them in the convertible one for a while longer. Going by the CDC/WHO growth chart for boys. If your child was in the 98% in both height and weight, the earliest that your child would be too big to rear face in a Graco MySize 70 is 4 years for weight and 9 years for height . That is a far cry from the 6 months and up I have been seeing. I do realize some kids ARE taller than average and heavier than average, but, the amount of people saying their kids were too big is WAY beyond the percentage that are included in the "too big" category. My point is, if you don't want to keep your kids rear facing after 6 months, 12 months..whatever, that's fine. But, please just say it's because you don't want to, not because they are too big. Because for the general population of kids under 2, they aren't too big. ETA: I am not saying a kid "CAN'T" be bigger than average or that if they are you are doing something wrong. My point is that MOST kids are still NOT too big to rearface before 2. No matter if they are at 100% for height and weight ...IF you get a seat that accommodates them properly. At 6 months old, if your kid is "too" big to rearface, you have a kid with a growth issue, not an average, run of the mill 6 month old. Great post, not to mention that before 1 year AND 20lbs forward facing is actually illegal in most states. Happily ERF my almost 18 month old and extended harness my 3 and 4 year olds. Both my kids were in the 99th percentile for height and weight. (My son was off the chart completely at 15 months for height) I rear faced them both until 18 & 21 months before I gave it up. (We have the Radian's) It can be done. It can be irritating, but it's not difficult. My 4 year old will remain in his radian 5 point harness until he outgrows it. (So, high school) As will my, 2 year old. If we (as a society) are smart, by the time my kids outgrow their seats all cars will come equipped with a 5 point harness system. It just is safer. This is a very simply, basic thing that can be done to keep your kids safer in a world full of uncertainty. I don't understand why so many parents feel it's too much bother.